They've been enjoying a fine run of things on the IPA front at Nomad in recent times, with their series of Supersonic Double IPAs, in particular, finding favour with drinkers; the Rainforest Lime edition made our Best New NSW Beers Of 2018 list. And so it is that the Northern Beaches brewers open their 2019 limited release account with two more: their take on a Brut IPA and a new version of one of their launch beers. The former is Champers, a can-conditioned beer, a version of which was initially released for the brewery's fourth birthday and which fills its 500ml tallboys with soft, predominantly tropical hop aromas. It's cloudier than many of the Bruts to have appeared to date and carries a little sweetness on the nose too. Champer is also relatively low in carbonation and more grippy than dry on the palate, with a body that is outrageously light for such a big beer: once you've taken in the juicy fruits, the experience soon disappears across the palate. 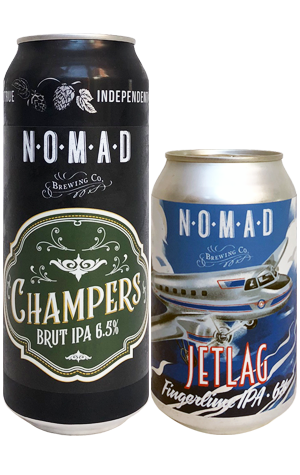 That's not the case with the new Jetlag, a fresh spin on the IPA that was one of Nomad's first three releases. Here, they've changed up the hops to feature a new blend of Aussie and US varieties (including many people's favourite, Mosaic) while keeping the native fingerlimes in place. The last of these make themselves known throughout, adding a potent limey flourish atop the citrus rind and piney hops also at play. There's a depth to the malt character and a lean, resinous bitterness eager to set up residency for a while.